On the right here is Marlowe Florists that sometimes gets rid of their stock at the end of the working day at knock-down prices. 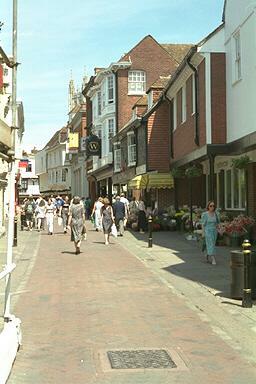 Further along are a couple of bookshops, Waterstons and Volume One Bookshop. You can make out the black sign with the W for Waterstones. Waterstones took over their premises from a business called Martins which sold womens clothes aimed at the 'older' woman. The top floor was a tea shop. Martins still runs the top floor café, with the remainder of the building being a bookshop.